After 12 years, $14 million and an incredible amount of perseverance, the historic Orpheum Theatre has been renovated for "adaptive reuse," restoring as much of its visible splendor as possible, while retrofitting it as a modern theatre capable of handling anything Broadway sends its way. And its marquee at Second Avenue and Adams Street again announces the names of first class productions, drawing thousands of people to a vibrant downtown venue. 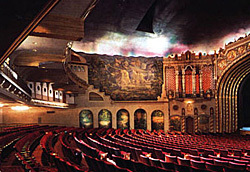 The Orpheum is owned and operated by the City of Phoenix, Phoenix Convention Center Department. Friends of the Orpheum provide educational and restoration support through volunteer and fundraising programs.